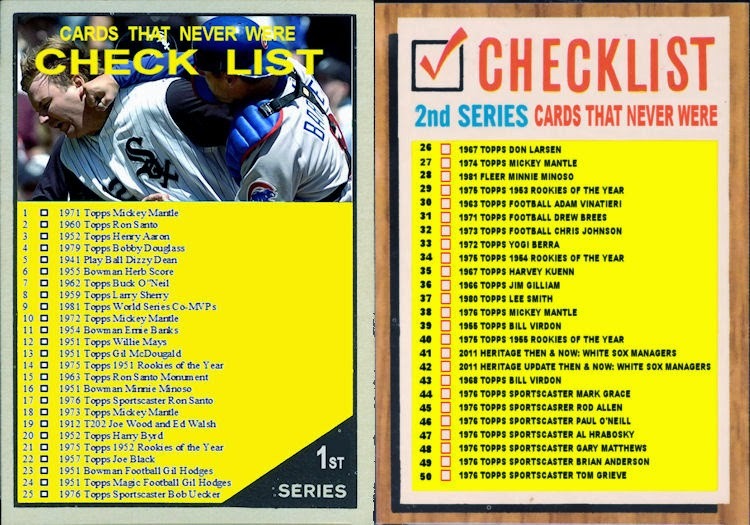 Once again, I have stuck with a variation of my own checklist design. This time I featured former Chicago Bear, Doug Buffone. Buffone passed away in April. 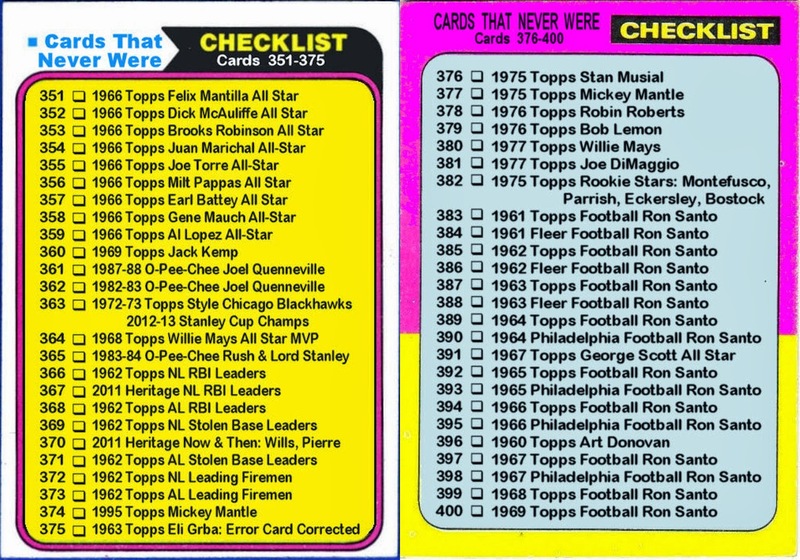 While looking for a suitable tribute card I discovered that despite a productive 14 year career, 8 of which he was defensive captain, Topps had made only 5 cards of him. 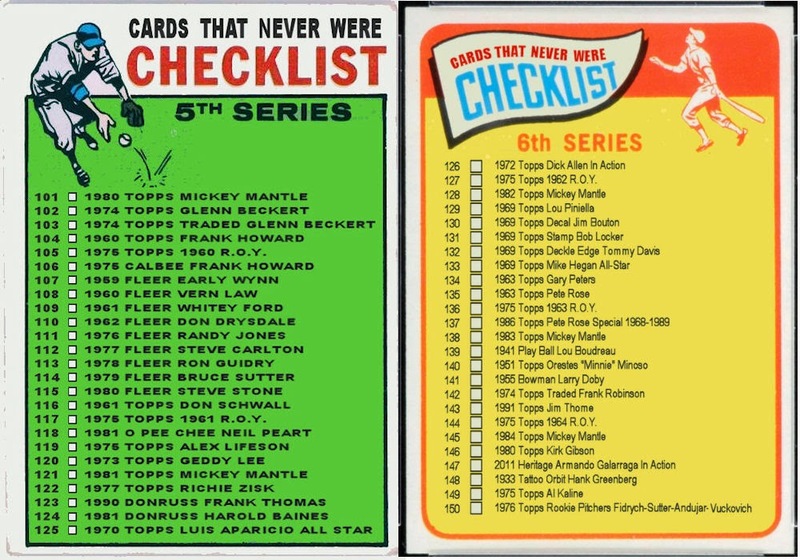 As you can see by the first 8 cards on this checklist, I picked up the slack. 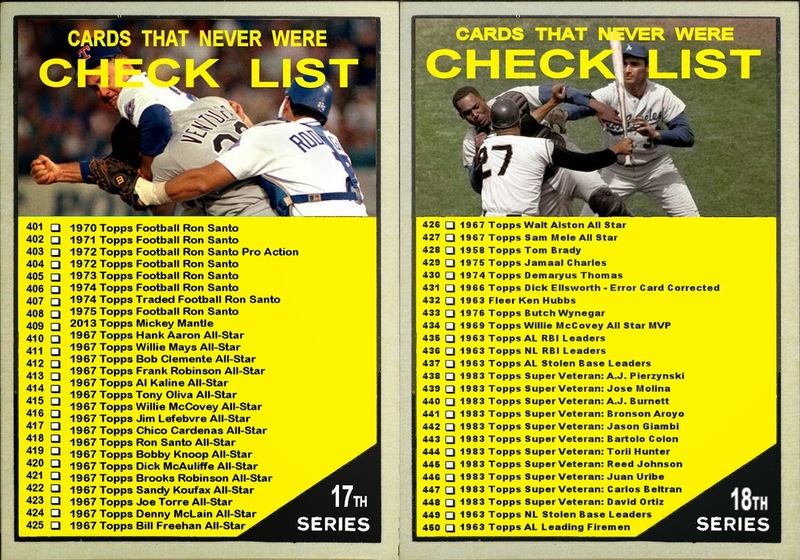 This series also includes several Cards That Never Were that were originally posted on my other blog, Rating the Rookies. 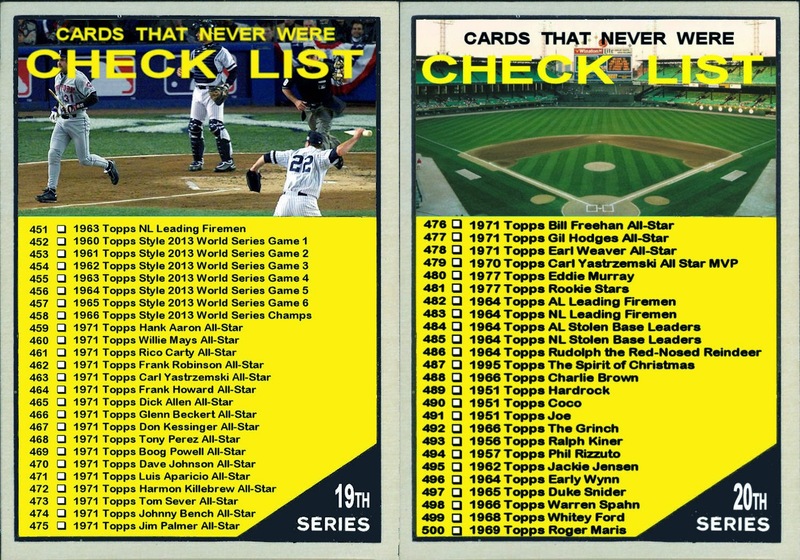 As always you can click here to see all the cards from this series in one page or you can click on the checklists on the right margin. 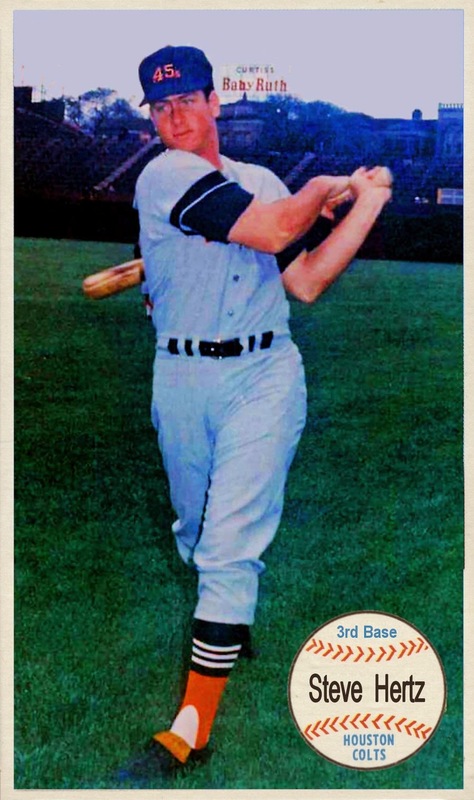 Four More from "Rating the Rookies"
This is a 1964 Topps Giant card of Steve Hertz. He had a career stat line of 4 plate appearances, 3 strikeouts, no hits, no walks, yet somehow he scored twice. 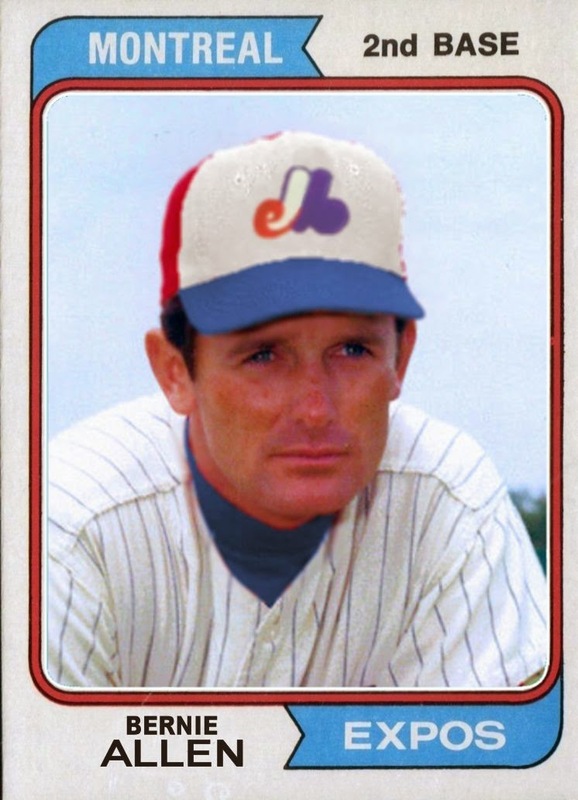 Click here for a link to his rookie card. 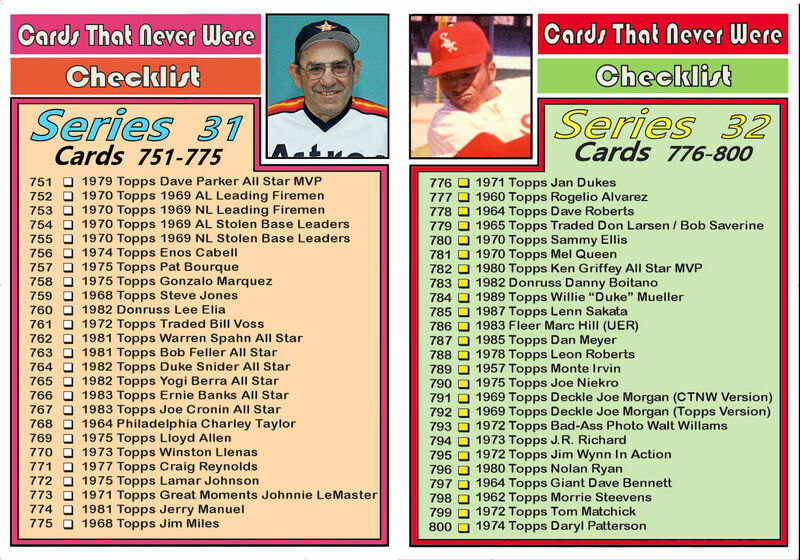 Here are a couple of career-capper Cards That Never Were for Bernie Allen and Phil Linz. 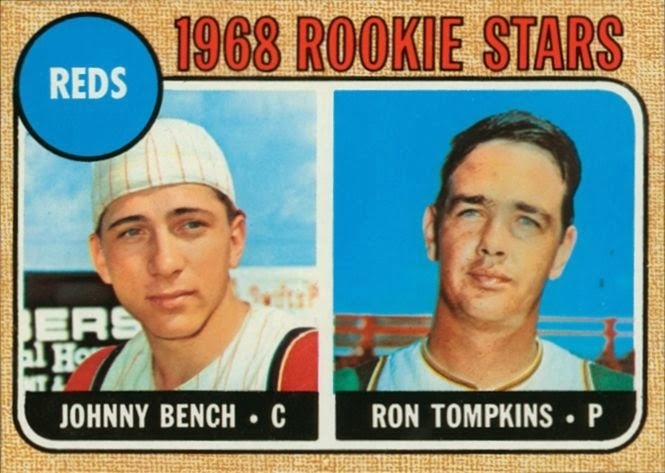 They were featured on a 1962 Topps Rookie Parade card. 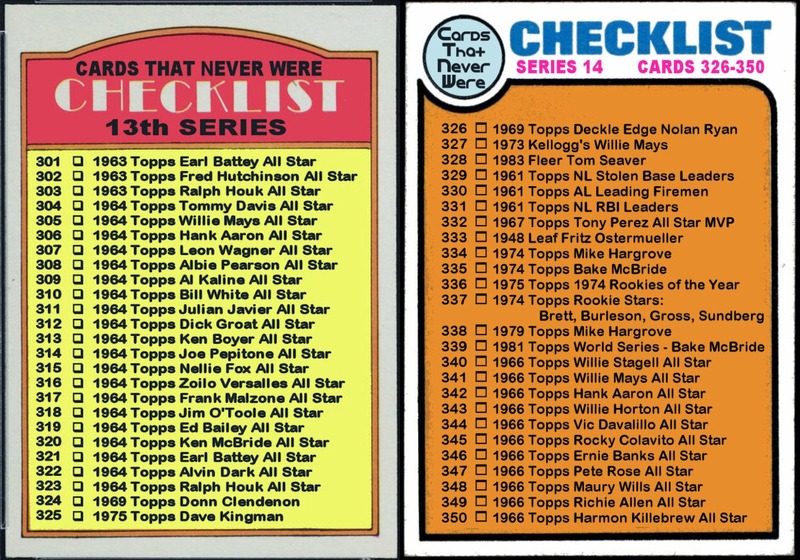 This was the first year Topps put out multi-player rookie cards. 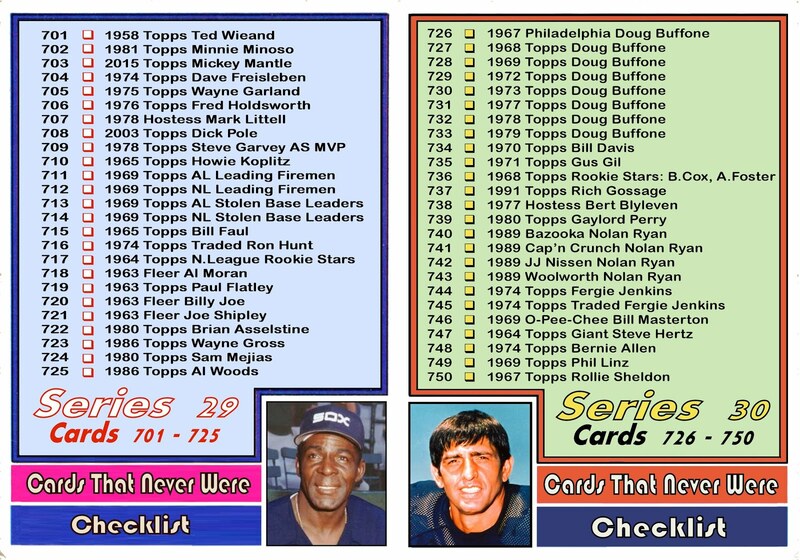 Click here to see the rookie card they shared with Rich Rollins and Joe Pepitone. This is a 1967 Card That Never Was of Rollie Sheldon showing him on the last MLB team he played for. 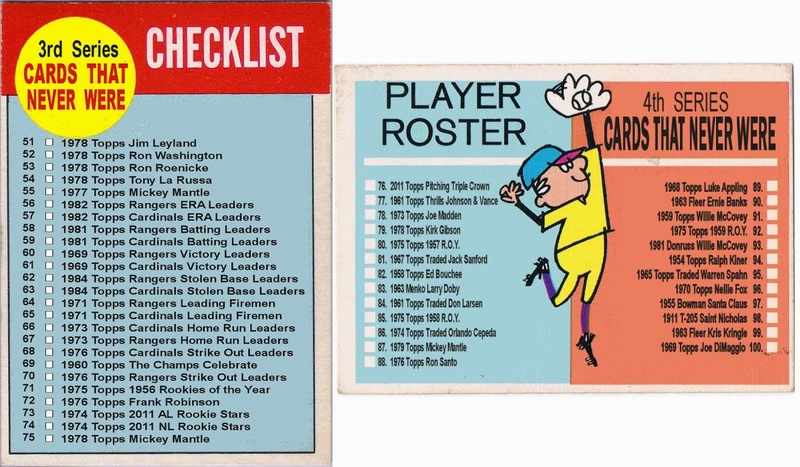 Even though he was on a 1969 Topps card as a Seattle Pilot, he never made the team. 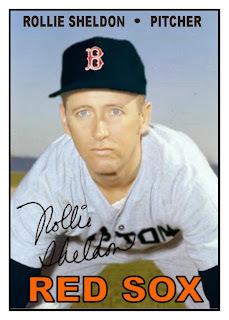 Sheldon was a 24 year old rookie for the Yankees in 1961. When they signed him his birthdate and high school graduation years were off by 4 years. They thought they were signing a 20 year old phenom. But with their pitching staff depleted due to the expansion draft, he earned a spot in the bullpen even after his correct age was determined. 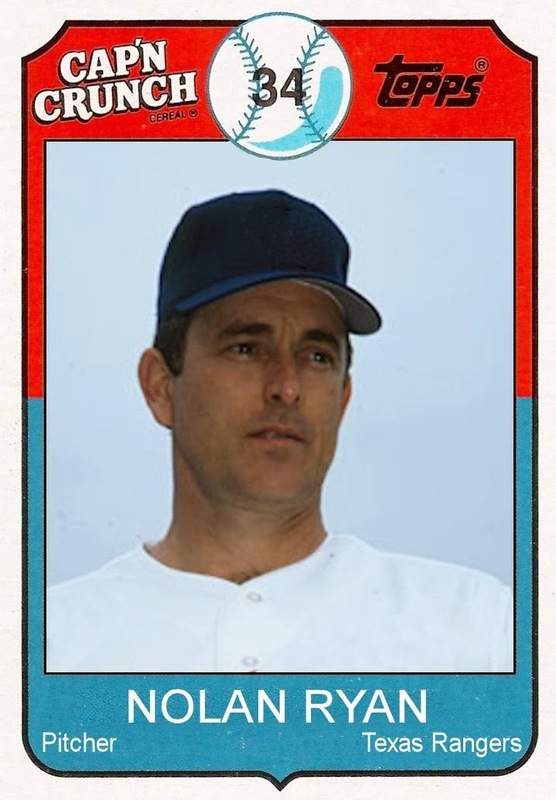 Click here to see his rookie card. It has been a while since I made a hockey card for this site. Now we're deep into the Stanley Cup playoffs, so I think it's time. Each year the NHL awards the Bill Masterton Memorial Trophy to the player "who best exemplifies the qualities of perseverance, sportsmanship and dedication to hockey". Most often the award is given to a player who has overcome a serious injury or illness. Masterton played 3 years for the University of Denver winning the Frozen 4 Championships in 1960 and 1961. At the time he graduated he was the Pioneers all time leading scorer. He was signed by the Montreal Canadiens but during the original 6 era there was very little opportunity for a minor league player. In 1967 the NHL expanded to 12 teams and opportunity knocked. He was signed by the Minnesota North Stars. Masterton played just 38 games that season. On January 13, 1968 he was checked at center ice. His head hit the ice knocking him out, bleeding from the ears, nose and mouth. He briefly regained consciousness but his head injuries were too severe. He died 30 hours later. 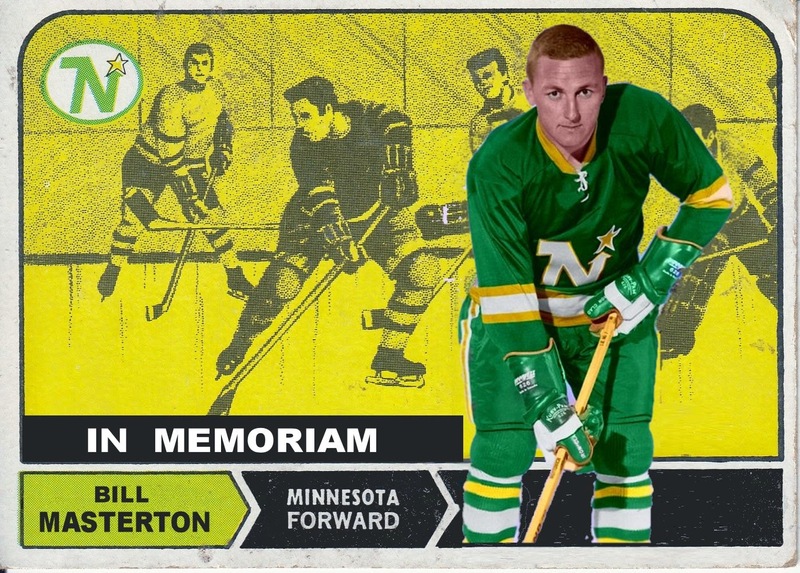 There have been several award cards bearing his name but Bill Masterton has never had a card of his own. 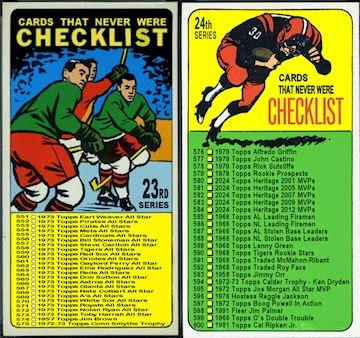 Even though the league expanded to 12 teams in 1967-68 the hockey cards issued that year only featured Original 6 teams. 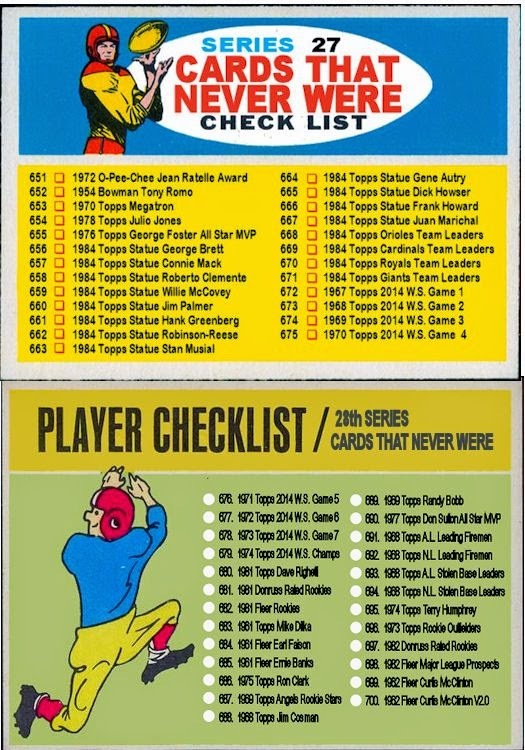 In the 1968-69 set expansion teams like the North Stars had cards as well. 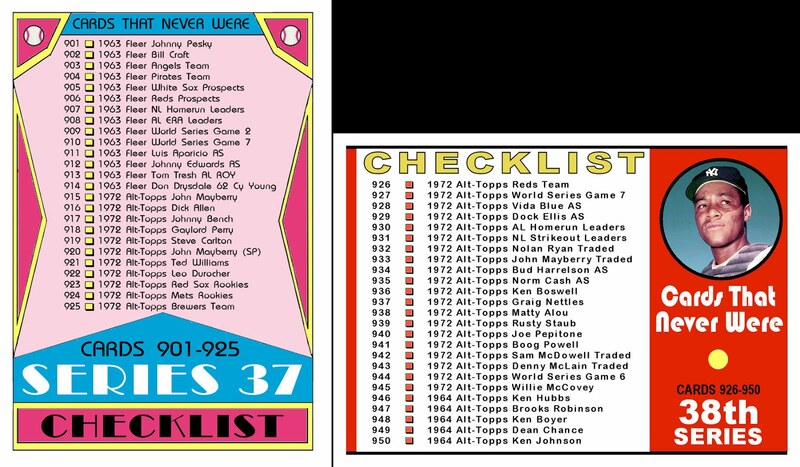 But Topps and O-Pee-Chee never made a card for Masterton. I created this one for Bill Masterton and borrowed the "In Memoriam" banner from the 1964 Topps Ken Hubbs baseball card. 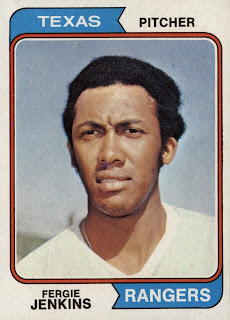 Granted, the real Topps Traded card most likely would have either been a terrible airbrush job or perhaps the hatless bed-head picture they used on his regular 1974 card. 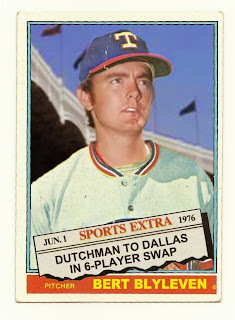 In 1976 when he was traded to the Red Sox, Topps did give him the full treatment with both a regular and an airbrushed traded card. 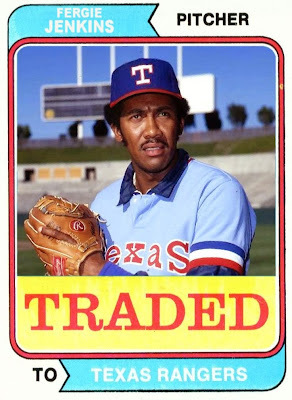 Fergie pitched in 197 games for the Rangers in 1975-75 and 1978-81. He had an overall record of 93-72. He is 4th on the all-time list in wins for the Rangers and his 25 win season in 1974 remains a Texas Rangers record. 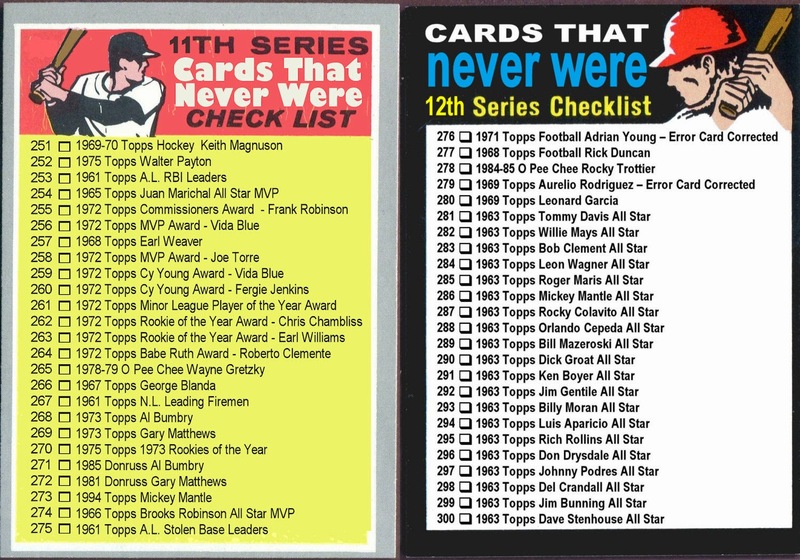 Above are 1989 Cards That Never Were from Bazooka, Cap'n Crunch, JJ Nissen (a bread company that was based in Maine) and Woolworth (a defunct department store). 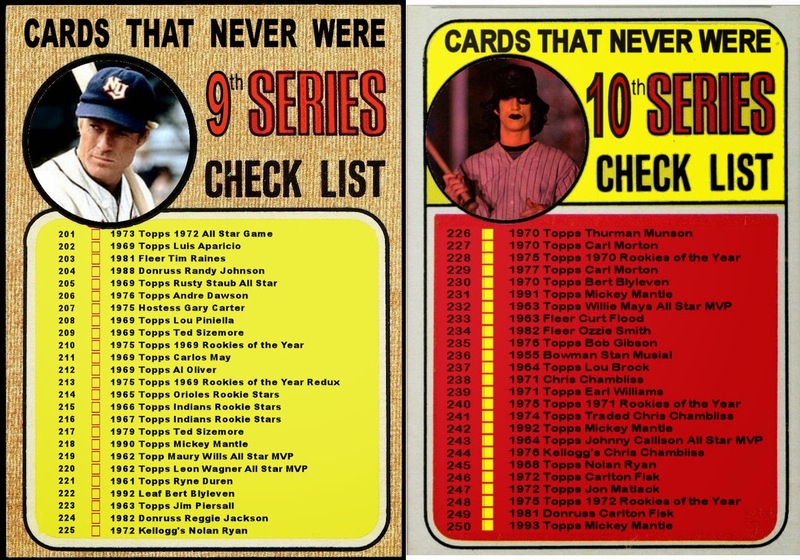 As you can see 3 of the 4 were produced by Topps but only 2 of the 4 were officially licensed. Therefore the logos had to be airbrushed out. 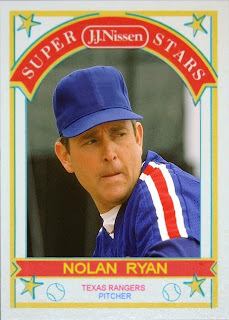 Ryan was traded to the Rangers at the ripe old age of 42. 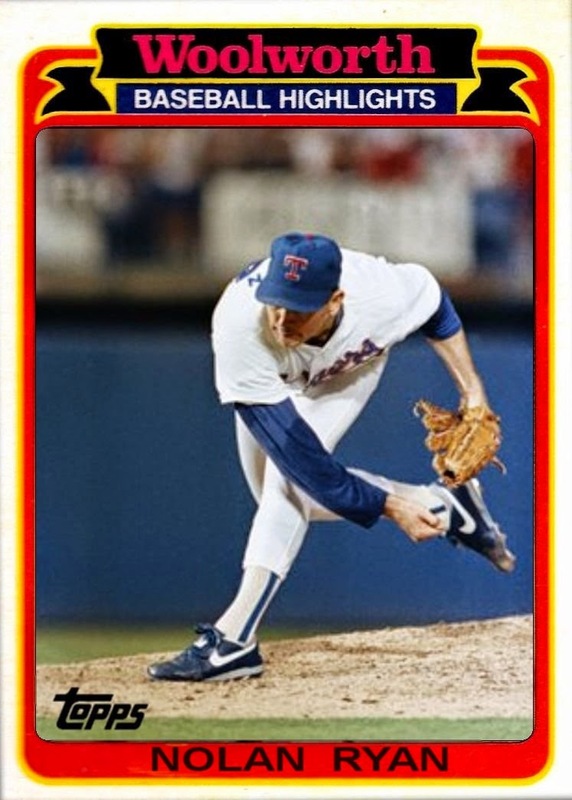 He still pitched 5 seasons and threw his 6th No-Hitter in 1990 and his 7th in 1991 both for the Rangers. His record was 51-39 in 129 games. 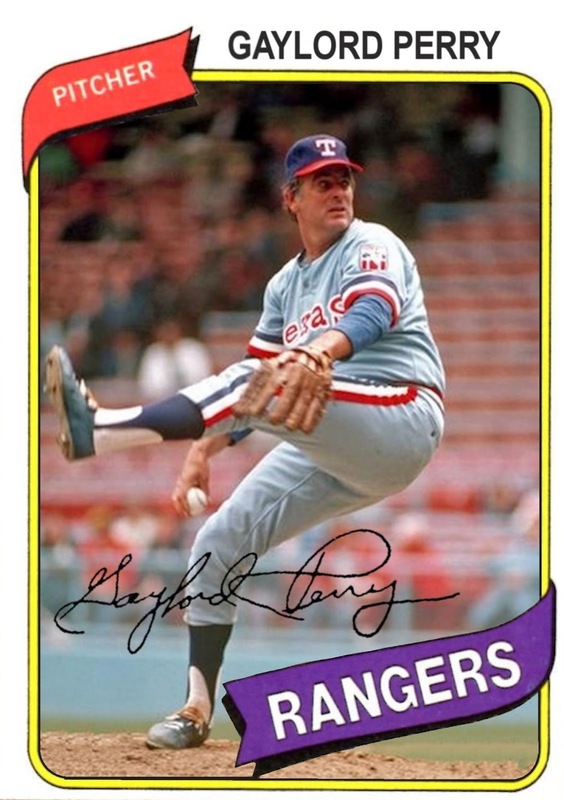 Gaylord Perry had 2 tours of duty with the Texas Rangers. 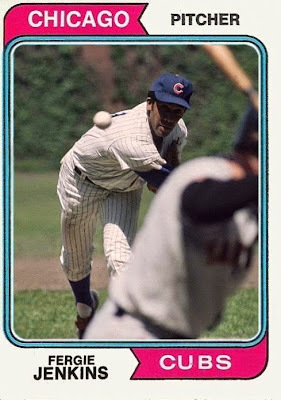 He spent part of the 1975 season and all of 1976 and 1977 as the result of a trade from Cleveland. In 1980 he was once again dealt to the Rangers after his final All-Star season in San Diego. Overall Perry played on 8 different teams over his 22 seasons. He played 112 games for the Rangers over parts of 4 seasons. He was 48-43 with a 3.26 ERA for Texas. 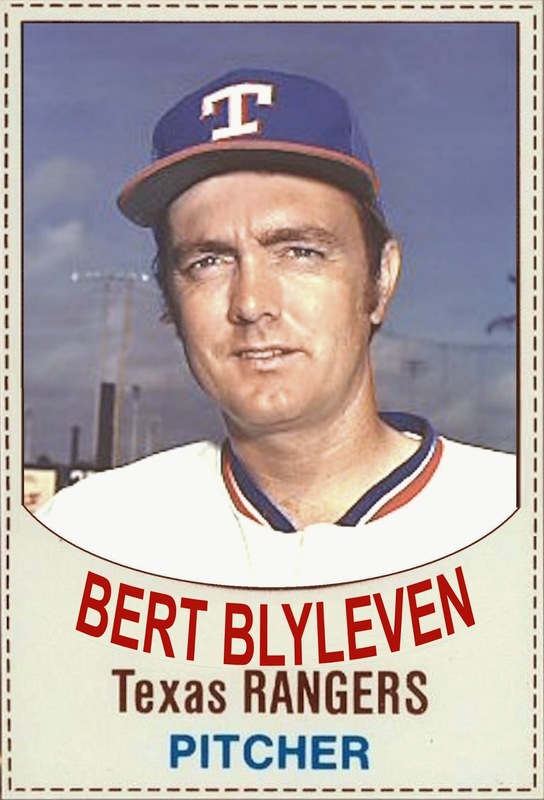 Bert Blyleven was traded from the Twins to the Rangers in June of 1976 along with shortstop Danny Thompson for 4 players and $250,000. He pitched 54 games over the remainder of the 1976 season and the 1977 season. His 23-23 record doesn't tell the whole story of his time in Texas. He had a 2.74 ERA and threw 11 shutouts and 29 of his 54 starts resulted in complete games. 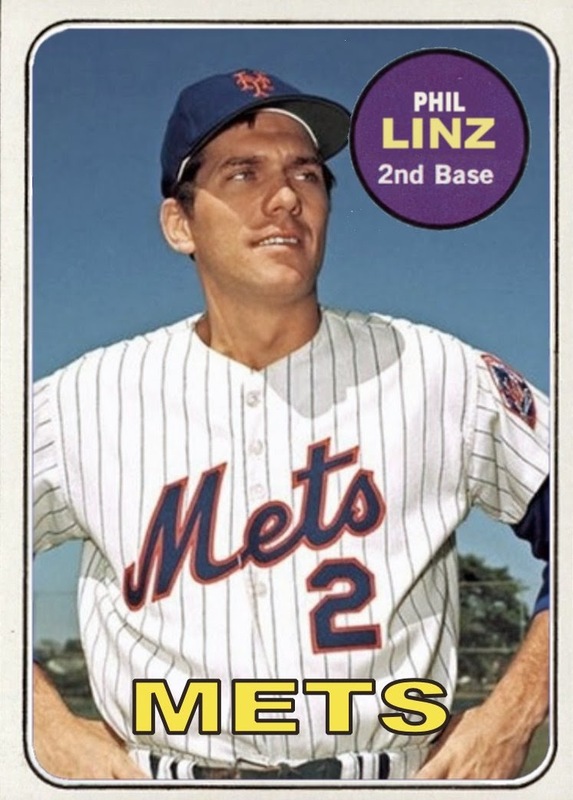 He averaged just over 8 innings per start and in 1977 had the leagues best pitching ratio. 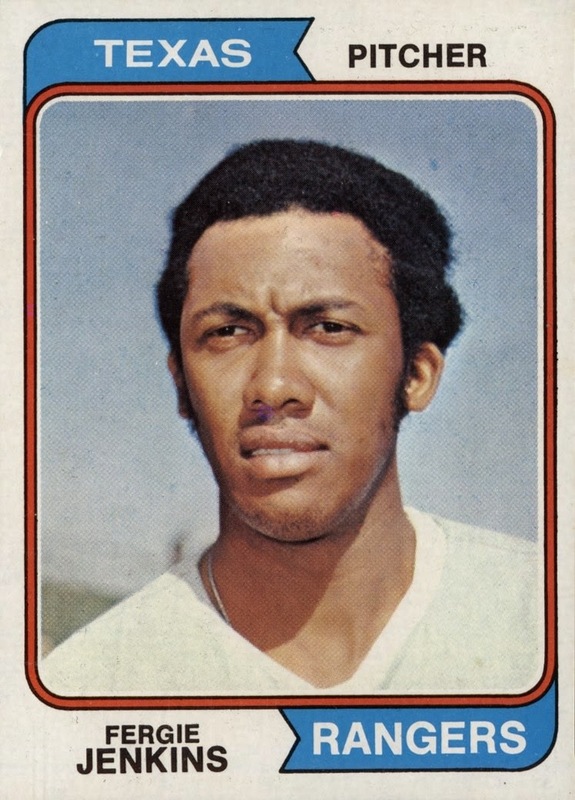 After the 1977 season he was sent to the Pirates as part of a 4 team 11 player trade. While I would have liked to create a 1976 Topps Traded card of Blyleven for this post, I had to settle for a 1977 Hostess Card That Never Was. 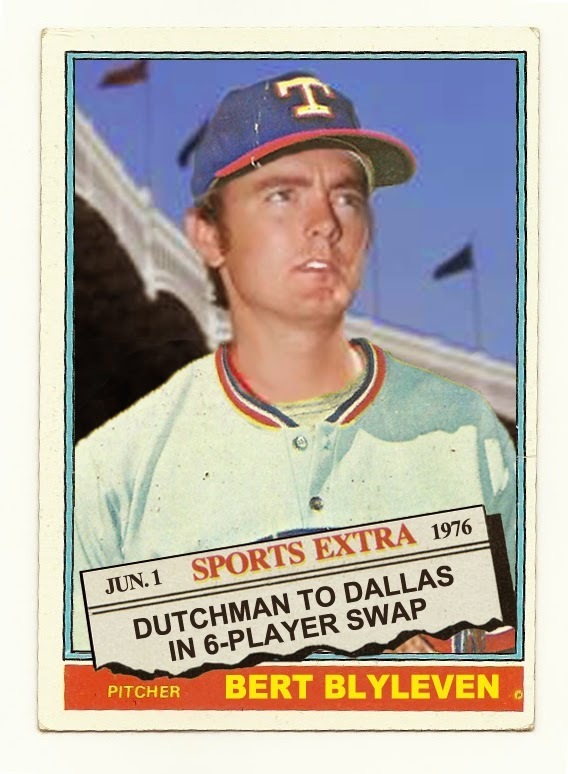 I was beaten to the punch by The Baseball Card Blog who created this gem as part of their "1976 Topps Traded: The Missing Cards: series. It has been months since I've made my Top 5 "Fan Favorites". For this one I've chosen to do the Texas Rangers. 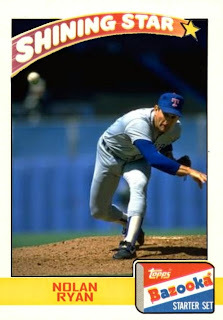 Additionally I've narrowed it down to the Hall of Fame pitchers who have worn the Rangers' colors. Here they are in the order of games pitched for the Rangers. I'm sure you can guess most of them, but you may be surprised by which Hall of Famer pitched the most games in Texas. In 1989, Goose Gossage was released by the Cubs during spring training, was waived by the Giants mid-season. He was picked up by the Yankees where he finished out the season. After the season, the Yankees dropped him as well. 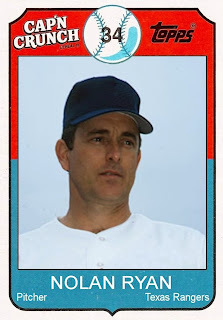 Gossage spent the 1990 season in Japan pitching for the Fukuoka Daiei Hawks. 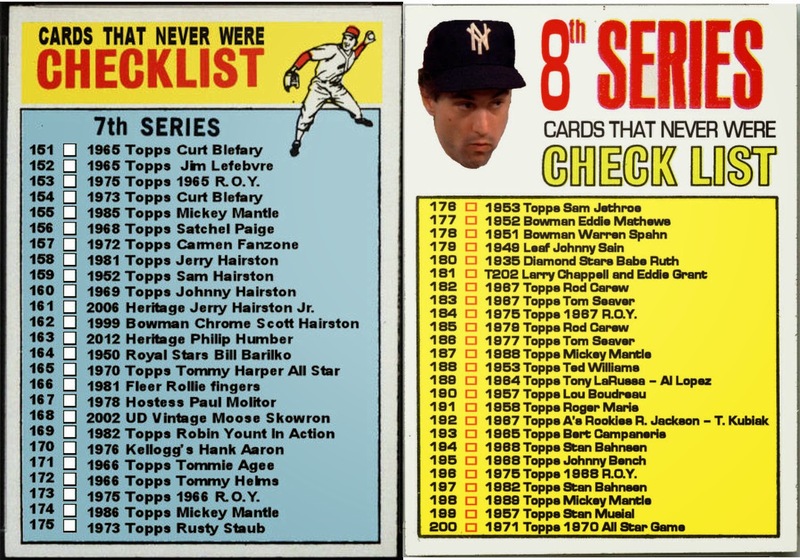 Topps didn't make a 1990 card for him, "career-capper" or otherwise. 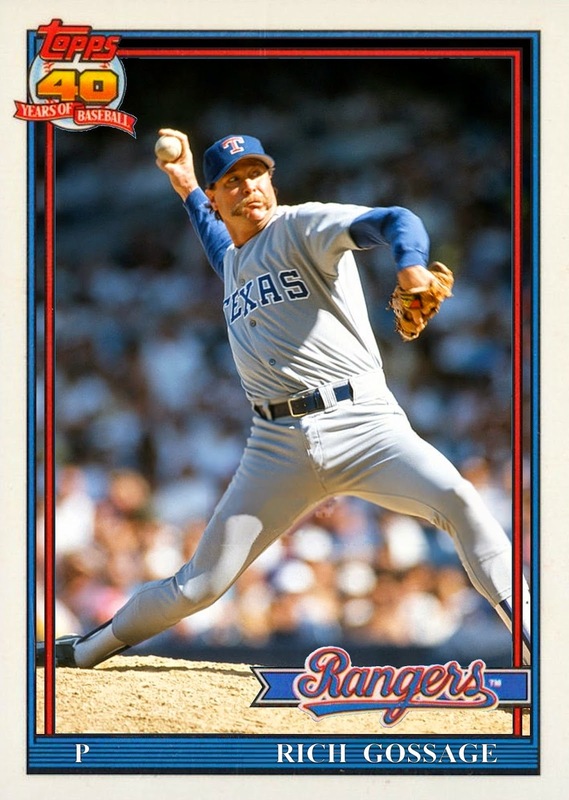 In 1991 he was signed by the Rangers where he pitched in 44 games, mostly middle relief. His days as a closer were behind him by then. 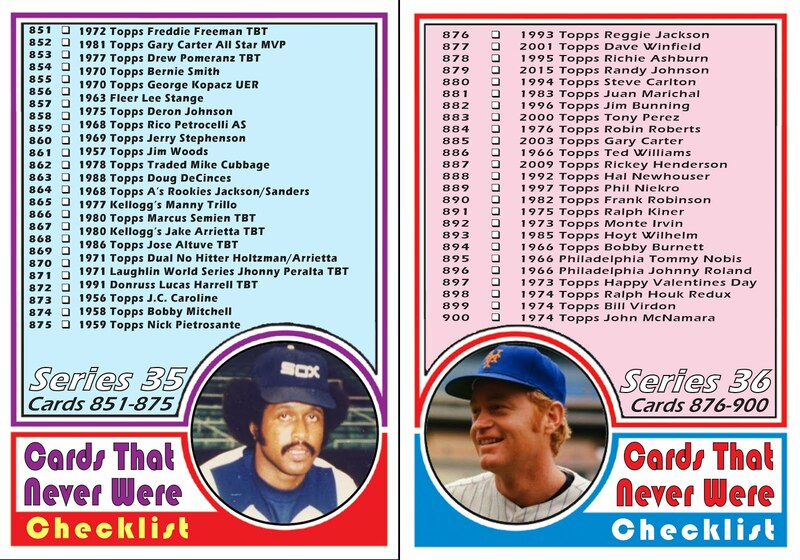 Gossage was also missing from the Topps set in 1991, not even a Topps Traded card. They did make a 1992 card of him in a Rangers uniform. 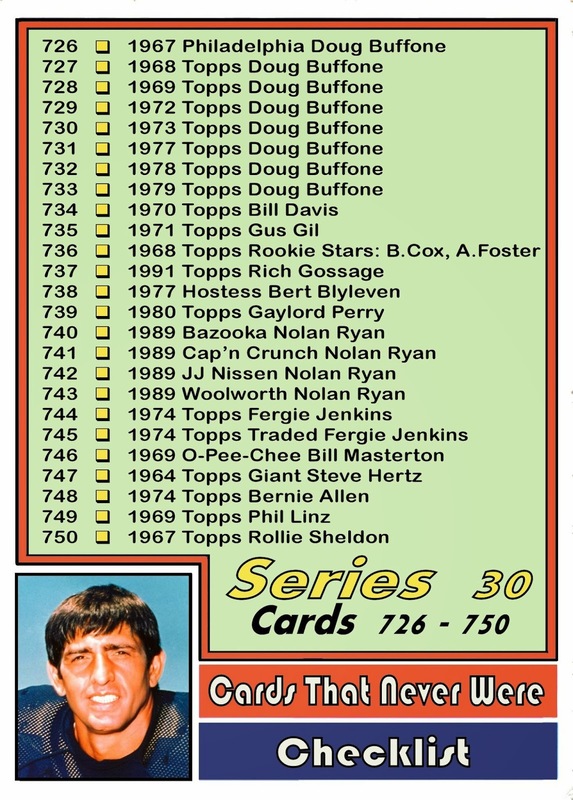 That would be Topps' last regular issue card of the Goose. This despite him playing 1992 and 1993 in Oakland and 1994 in Seattle. 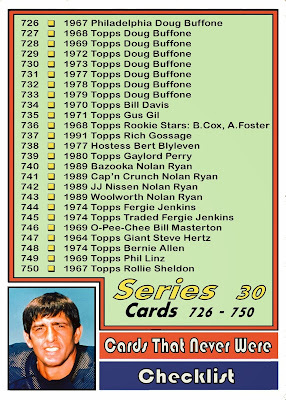 Seems like an awful lot of cards missing for a Hall of Fame pitcher, especially in the junk-wax era. Here is another card created for "Rating the Rookies". The reason I chose to use these players was to kill 2 birds with one stone. First, Bobby Cox played only 2 seasons at the Major League level before going on to his Hall of Fame managing career. He didn't have a card his rookie season, 1968. 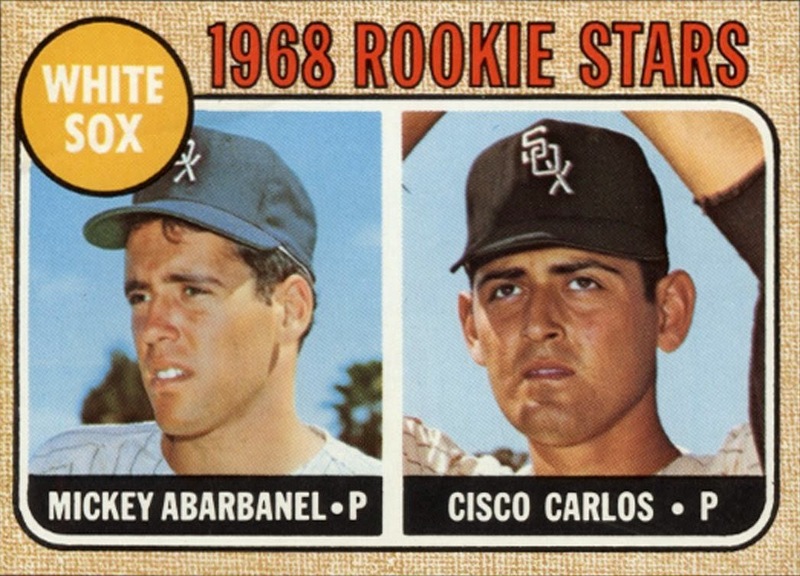 But his 1969 Topps card featured the "Topps 1968 All-Star Rookie" trophy. 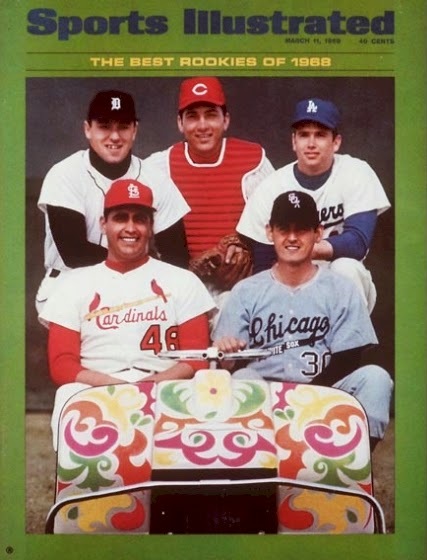 This cover featured Sports Illustrated's picks for the rookie class of 1968. 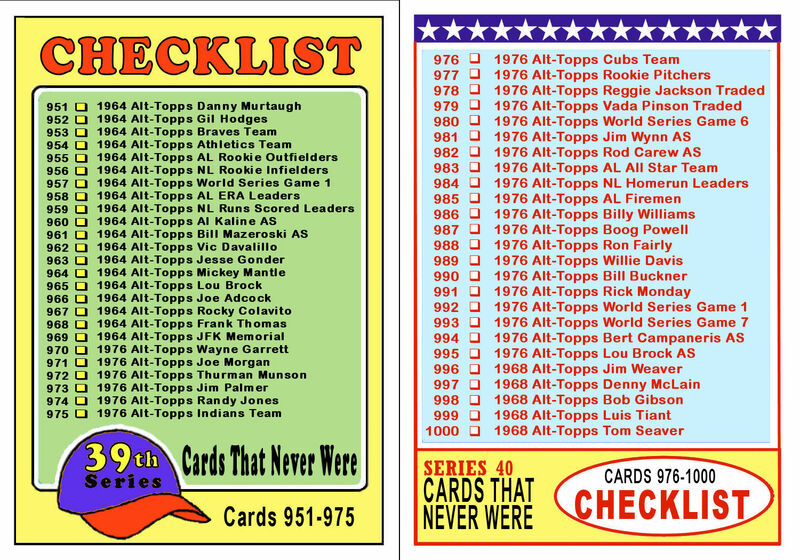 Of these 5, Topps agreed with SI on 3. 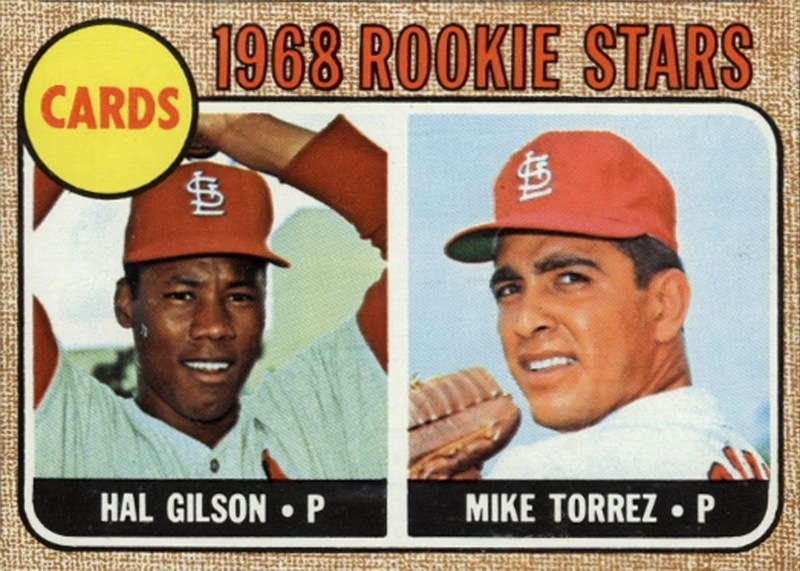 Johnny Bench, Mike Torrez and Cisco Carlos all had "Rookie Stars" cards in the 1968 Topps set. 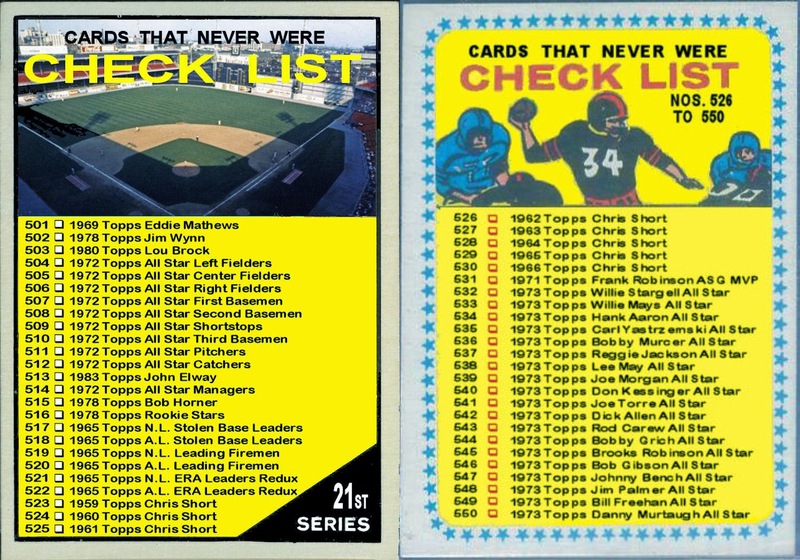 But Don Pepper (who never had any cards) and Alan Foster were left out. 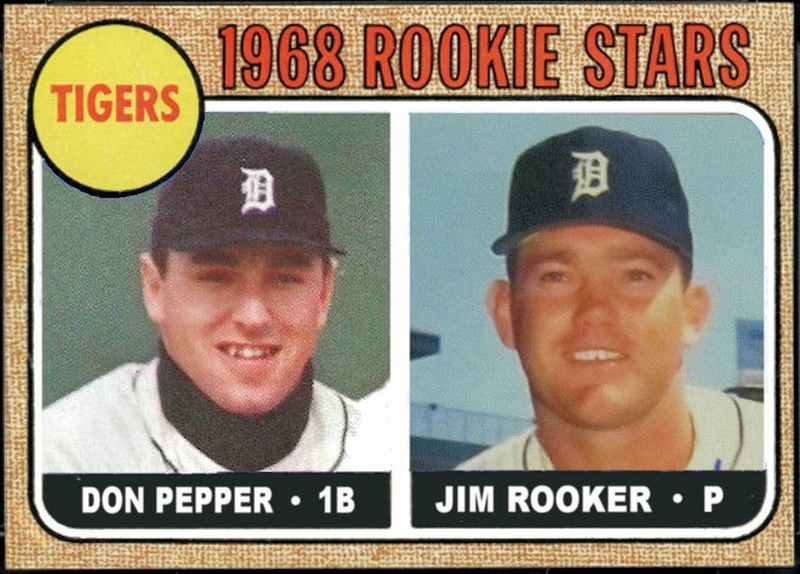 A while back, I created this card that included Don Pepper at the request of a Tigers' fan who wanted some cards commemorating their 1968 season. 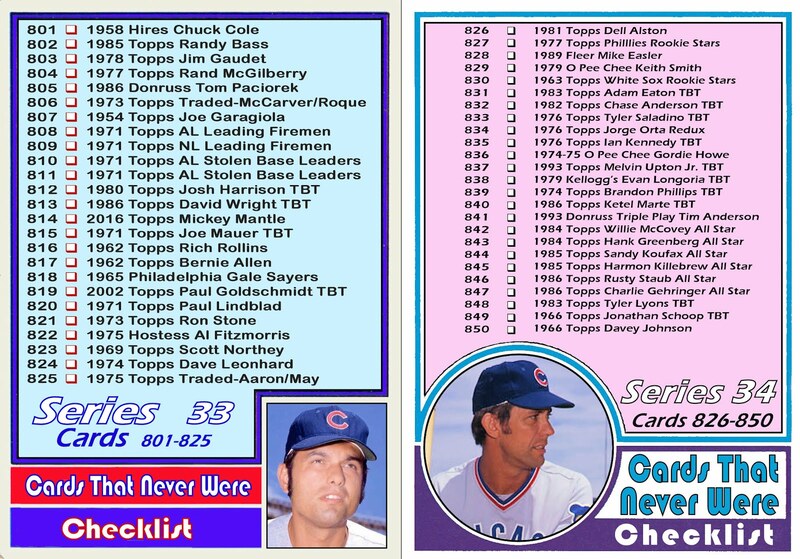 (He specifically wanted a Jim Rooker card among others.) Click here. 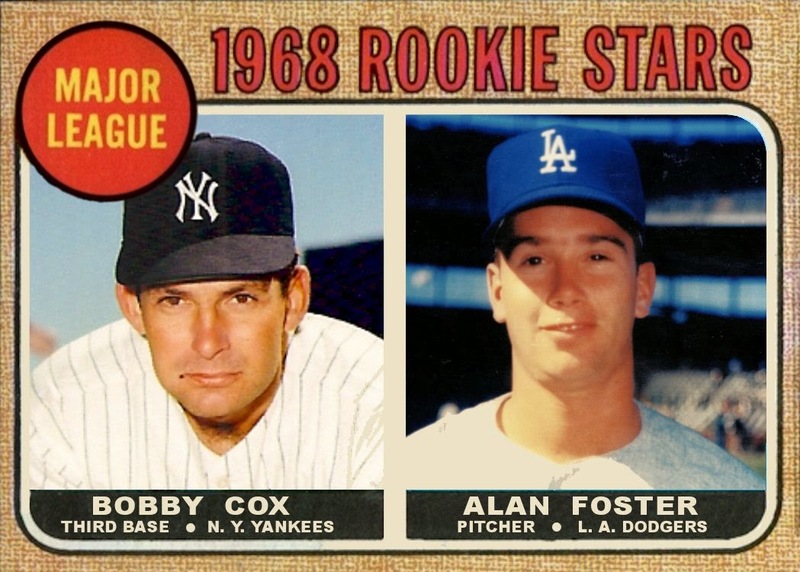 Now thanks to a randomly selected card from "Rating the Rookies", all 5 players now have 1968 Topps Rookie Stars cards to go along with the 1968 SI cover.